This is a faster paced version of “No Country For Old Men” from the perspective of Llewelyn Moss and Anton Chigurh. To tell “No Country For Old Men” from the perspective of Llewelyn Moss and Anton Chigurh by removing Sheriff Ed Tom Bell(Tommy Lee Jones) from the film. To create a faster paced story, by removing some redundant dialogue and some scene reorganisation. - Removed ALL scenes with TLJ, bar one which has been moved from the start of the film to a better location. - Remove TLJ V/O from start of film and cut down the scenes of the ‘country’ at dawn. - Change start of the film. No scene with Anton being arrested and escaping. - Remove Anton pulling over a car and killing the driver. - Some scene rearrangement to help flow and to build Anton as a psychopath. - Trims to Carson Wells’ dialogue : Validating a car ticket and ‘ATM’. Harms his character. - A new ‘montage’ to show the climax. - It’s not Carla’s mother’s funeral we’re at. - Carla visualises Llewelyn’s death. 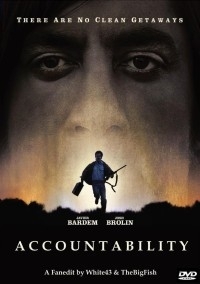 No Country for Old Men is an unique film. Part of it (mostly the Brolin/Bardem stuff) is a tense, suspenseful, violent thriller, and all of that is balanced with the poetic and introspective Tommy Lee Jones stuff. The contrast is what makes it special in my opinion. So, what happens if one succumbs to the temptation of having the thriller part only? What happens is, it gets transformed into a totally different experience. What’s lost in introspection is won in tension. Now the movie resembles a neat 70s/80s movie in the vein of Sam Peckinpah, which has the feeling of an art film (the opening landscape shots without the narration remind me of the beginning of 2001. Loved that!) that wastes no moments and increases suspense by keeping us focused on Moss all the time. It’s not better than the original, only different but about equally good. In the beginning, at least. The ending, while a good concept, feels rushed, particularly Chigurh’s final fadeout. That screams fanedited. If the video and audio had been faded out at different points, video earlier than audio, it would have worked much better. As it is now, it feels abrupt. And then, we get an epilogue with Tommy Lee Jones that totally breaks the mood built up to that point. It’s puzzling, pointless and unneeded. I know the editor has defended its inclusion, but it’s just how it plays for me. The Chigurh fadeout would have worked much better as a finale. Twchnically this works okay, even if the crossfade at 0:16:30 doesn’t seem totally natural, and there’s a flash frame (from the bus sequence) at 0:25:15. Ugh. This is an edit with a lot of possibilities it doesn’t totally fulfill in the end. With a little more work it would have been a classic. As it is, I give it a 6/10. I am a true fan of the original, but since it’s already a while ago since I last watched it and always want to give drastic edits a chance, I gave this one a try. As for all my reviews: this is just my personal opinion of this fanedit. I cannot tell anybody else, if he or she will experience it in the same way or the opposite. So my review is not objective and does not reflect the opinion of fanedit.org. !!! !This review contains heavy spoilers!!! It started with a plain black on white text for the fanedit title. Then the movie started. And to my surprise it worked really well to not see Tommy Lee Jones at all… until the finale started, when all of a sudden things don’t fit anymore to the style. There are loads of fades to black and clearly stuff is missing, as there are huge jumps. The original always took its time, that’s the style it was told in. To break that spoiled the entire movie for me. Until that point everything was truly nice to watch and really entertaining. I wish the editor could have kept the NCFOM style and finish what he started so well. In its current state I cannot recommend this fanedit. The finale turns all previous entertainment to a bad experience and leaves me disappointed. Image quality was good, the fades to black in the end were distracting though. No hard video cuts noticed. The audio editing was good. I did not notice anything disturbing. It’s an avi, there are no extras, there are no special end credits and a weak title sequence that just does the job. There is cover art. For an avi the presentation without self created end credits is not really satisfying. The info given for this fanedit is very little without much effort. Godzilla was a much more detailed project that showed creativity and enthusiasm. This one does not. overall: a 4 of 10 rating from me for presentation. I am hoping for a fixed version. Thing is Boon, you need some sort of comment in order to improve…..
Yours is the first and I had some comments from Mollo. I wasn’t prepared to do a DVD without some comments first…..in case I had to go back. A DVD presentation – I would change end credits. The fades are in the same place as in the film. We added one for the last scene, it felt too quick to blend to the final. Llewellyns deaths is pretty abrupt in the original, what you see is what TLJ sees anyhow(it fades on Llewellyn and TLJ witnesses the Mexicans running and finds Llewellyn dead. Llewellyn’s girlfriend then arrives in the next scene which is night. TLJ says nothing.). The ending plays longer as TLJ investigates the scene – Llewellyn’s girlfriend knows to come to the place, as Lewellyn invited her. It plays exactly like the original in this sense.. Only here(in our version), it’s not clear who kills Llewellyn. We took the decision that the funeral should be Llewellyns, the mother’s funeral seemed a bit odd. I could have course cut the final scene, but felt it was almost a tribute to TLJ that it all happened before they realised what was going on and including him in that. NCFOM just kinda ends abruptly with TLJ and this one is similar. I have some ideas, but how to change the ending might be a little tougher. I’m glad you enjoyed the first 3/4 anyway!